No matter how cool it looks, spending hours at an uncomfortable battlestation can lead to annoying aches and hurt your gaming performance. When setting up your gaming station, consider your height before you decide on your desk. You don’t want your neck to be at an awkward angle when you’re looking at your monitor for hours. You should also pay attention to where your keyboard and mouse will be sitting relative to your height. If they sit at an unnatural angle for your arms, not only will you be uncomfortable, but you may also increase the possibility of wrist injuries. Sitting for hours with an uncomfortable chair isn’t fun, and it will be less so if your back starts to ache from poor support. Invest in a good chair that is right for your height and helps you keep maintain good posture during long gaming sessions. It’s equally as important that your eyes be as comfortable as the rest of your body. That means that you need to make sure you have adequate lighting so that you don’t strain your eyes. A bright screen in a dim room can hurt your vision and cause headaches. Of course you can change your monitor’s brightness, but ideally you should have enough lighting to keep from straining your eyes when you look away from your screen. You may want to invest in a lamp with multiple light settings in order to get the best lighting at every time of day. Glare is another issue that can be one of the most annoying interruptions to gaming, especially if the games you’re playing have dark settings. 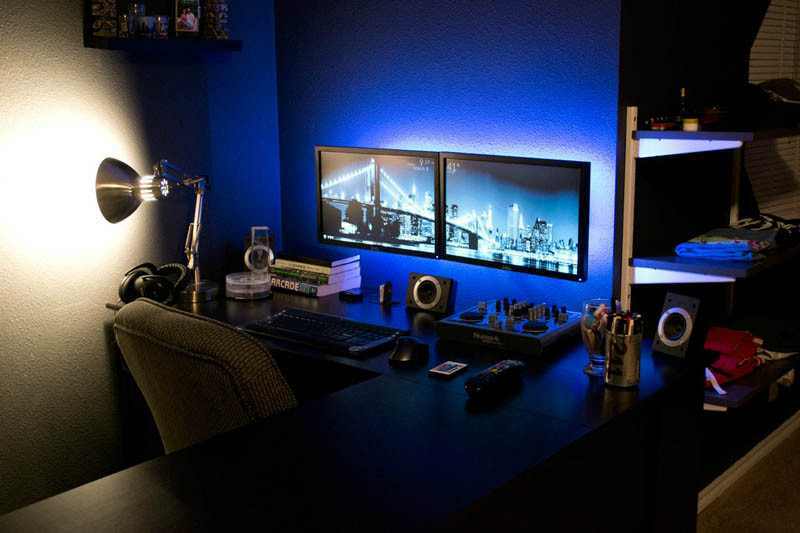 Think strategically about where you place your gaming station to avoid annoying glare from windows, lamps, and overhead lighting that can affect your gaming performance. Ventilation is a big deal for two reasons. First, you need to make sure your computer doesn’t overheat. This means making sure vents have plenty of room for intake and output of air. You should avoid placing your case on the floor, particularly if your gaming room is carpeted, since this can increase dust in your fans, and make it hard for your computer to expel heat. Investing in a desk with a shelf for your tower is a great idea because it keeps the case off the floor and gives it plenty of room to breathe. Second, consider room ventilation. A small room may be cozy for gaming in the winter, but you may get uncomfortable in warmer months. The more electronic devices you have, the more heat you’ll be producing when you game. The heat will get worse if you have to shut the door. If you’re too hot or too cold, you won’t be playing your best. 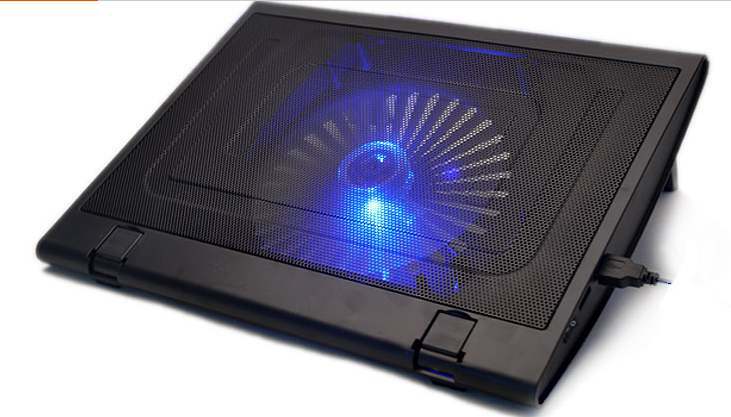 Make sure you have an way to cool the room, like a good fan, when hours of playing have overheated it. Is there anything more frustrating than arranging furniture and then realizing you have to move it all again because your electronics aren’t near outlets? Don’t forget to check out your wiring situation before you invest in a gaming set-up, or you may find that your plan won’t work for your space. While extension cords may help, your dream set-up probably doesn’t include wires running across the room that can be tripped over and can damage your gear. Make sure you decide whether you’re going to play with wireless connection or by directly connecting to your router for better Internet stability? Try to think about where your can directly connect to the Internet so that your Ethernet cord isn’t a hazard to yourself and your computer. You may also want to invest in Velcro strips that help you keep cords straight and untangled to manage the mess and keep cords from getting in the way when you move or clean. 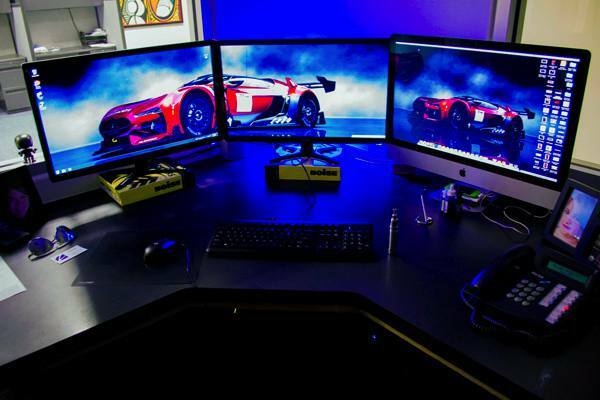 Do you have any other tips for gamers designing their battlestations? thank daskeyboard to share post.